Robert Eggers debut feature The VVitch is a film that has great aspects to it and moments of genuine intrigue. It is a confident movie from a first time filmmaker, the only problem, it is not very scary. The VVitch safely proclaims itself to be a “New England folktale” and not a horror story so that way if it does not terrify you it can be forgiven because perhaps that was not what the filmmaker intended. What The VVitch is actually about is our nations fears and values. Historically, the United States has a long history of fearing women, sexuality, and God. We are a nation capable of turning our backs on each other and declaring someone that we think we know a label such as a “witch”, or a “devil”, or a “terrorist”. By casting someone out of our family or community is an easy way to get rid of a problem. It is easy to scapegoat a person or group as “the other”, an evil entity that threatens our culture, but much harder to look into ourselves and our community to try and remedy a problem. That is what The VVitch is really about. The opening shot is of a young blonde girl’s face straight on, so from the get-go we know that she is going to be central to the narrative. She is the oldest teenage daughter of a family that is being banished from a Massachusetts colony, possibly Plymouth based on the pilgrim costumes and the religious emphasis of the language they use. We then see the most gorgeous shot in the entire film as her family and all of their belongings leave the walls of the colony. They are going off into the unknown, the darkness, with only themselves against any dangers they might face. The sunset as the camera lingers for a while on this shot while they ride away into dark shadowy trees is more haunting than it is beautiful and is the most powerful single shot of the picture. Nobody can deny that The VVitch is a very well-made film. It features stark, cold cinematography of an unforgiving wilderness. Taking place about sixty years prior to the famous Salem Witch Trials there really are no people around our family once they leave the colony, nobody other than possibly a witch that can change forms and terrorize our isolated puritan family. The setting is very refreshing which makes The VVitch stand out from your typical horror fare. The location and themes that it deals with will no doubt make people think of Arthur Miller’s The Crucible, written back in the 1950s as an indictment on McCarthyism. 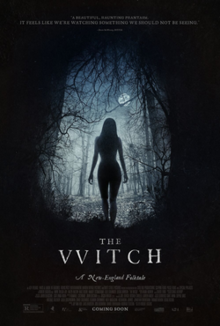 Also, like The Crucible, this film could have worked as a stage play since there really is only one setting and the family make up the majority of the characters on screen.The VVitch is not as overtly political but it does paint a portrait of how our country was born into being a God-fearing nation. Throughout The VVitch we see children being raised by fear of God’s wrath. This element of religion mixed with fear is not only done overtly with the dialogue but also with the images we see on screen. As the story progresses and members of the family turn on each other and blame each other for inexplicable tragedies that befall them, there is Biblical symbolism, the most obvious is with a bloody red apple. Whenever the “witch” presence is felt the color red appears on screen. Also, do not think for a second that it was an accident they made a black goat the pivotal animal that causes the most distress for our family. It is almost too blatant that the creature they chose is meant to parallel how our culture depends on scapegoats. Listen closely to a lot of the rhetoric spouted by the leading Republican candidates running for President and one can understand that when they blame foreigners and other “outsiders” for our nation’s problems, the search for easy answers to blame someone and banish them started back during the colonial period with our first English settlers. The middle portion of the film moves very slowly, too slow for most people with each scene meandering into the next. The audience keeps waiting for something to happen and it takes a while for something interesting to actually occur. There are payoffs from making us wait but they never quite reach the fever pitch you expect from a horror movie. Nor do the gory images and graphic moments resonate on a deeper level. The VVitch never made me feel scared or uncomfortable like some great horror movies do. Ultimately The VVitch is a very well directed film rich with symbolism and themes about the origins of our fears as a nation. The film works best as a story about the power of religion in our past and how the fear of God still resonates in our culture today. It has some suspenseful moments that work on a dramatic and historical level, however those looking for a genuinely terrifying experience in a dark theater may be disappointed.